Panoramic view of Oia, Santorini island (Thira), Greece. English : Panoramic view of Oia, Santorini island (Thira), Greece. Glowing noble gases in glass vials with low pressure inside. English : Glowing noble gases in glass vials with low pressure inside. Torre Agbar in Barcelona, Spain. English : Torre Agbar in Barcelona, Spain. English : POV-video from the Helix roller coaster at Liseberg in Gothenburg, Sweden. The Party House, Largo, Sofia, Bulgaria. English : The Party House, Largo, Sofia, Bulgaria. English : A330 prototype being towed to a parking spot at Airbus Delivery Center Henri Ziegler. Panoramic view of Istanbul: Yeni Cami (The New Mosque) and Galata Bridge. Turkey, Southeastern Europe. English : Panoramic view of Istanbul: Yeni Cami (The New Mosque) and Galata Bridge. Turkey, Southeastern Europe. Ruins of the Hermitage Saint-Antoine. Castelnau-de-Guers, Hérault, France. English : Ruins of the Hermitage Saint-Antoine. Castelnau-de-Guers, Hérault, France. English : Making a Living (USA, 1914) is the first film starring Charlie Chaplin. English : Northern pig-tailed macaque (Macaca leonina) - Khao Yai National Park, Thailand. Drainage ditch (Kettbach) at sunrise in morning mist near Dulmen, North Rhine-Westphalia, Germany. English : Drainage ditch (Kettbach) at sunrise in morning mist near Dulmen, North Rhine-Westphalia, Germany. English : The waterfall Tatzelwurm is situated in the Protected landscape area Auerbachtal, Bavaria, Germany. This video shows the upper stage by pivoting the camera. Ruddy Kingfisher (Halcyon coromanda) at Kaeng Krachan National Park, Thailand. English : Ruddy Kingfisher (Halcyon coromanda) at Kaeng Krachan National Park, Thailand. English : First X-ray cinematograph film ever taken shown by Dr. Macintyre at the London Royal Society 1897. English : Audio recording of Le Pont Mirabeau by Guillaume Apollinaire by Laurie Willième for the Opération Thalie Envolée. Gunnar Sønsteby (born January 11, 1918, deceased May 10, 2012) was a Norwegian resistance fighter during World War II. English : Gunnar Sønsteby (born January 11, 1918, deceased May 10, 2012) was a Norwegian resistance fighter during World War II. English : The Optical Payload for Lasercomm Science will beam video via laser from the International Space Station back to Earth. View from watchtower to Männikjärve Bog, Endla Nature Reserve, Estonia. English : View from watchtower to Männikjärve Bog, Endla Nature Reserve, Estonia. Mausoleum to a husband and benefactor in Pavlovsk Park, St Petersburg, Russia. English : Mausoleum to a husband and benefactor in Pavlovsk Park, St Petersburg, Russia. English : Man and woman dancing a waltz (1887). Animation based on Eadweard Muybridge motion studies. General Rafael Urdaneta Bridge on the Lake Maracaibo. The bridge was projected by Riccardo Morandi. English : General Rafael Urdaneta Bridge on the Lake Maracaibo. The bridge was projected by Riccardo Morandi. English : Antonio de Cabezón: Duuiensela (performed on a clavichord by Joan Benson). English : Redwing (Turdus iliacus) in a meadow. Taken in Texel, the Netherlands. Valley View in Yosemite National Park. 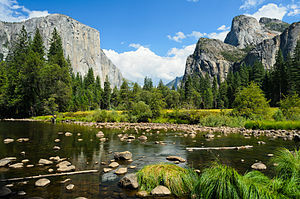 English : Valley View in Yosemite National Park. English : View from driver's perspective along North Beach Road in North Beach, Western Australia. Traffic controllers direct traffic through half of a roundabout with STOP / SLOW signs, using contraflow conditions. English : Audio recording of Le Cœur Volé by Arthur Rimbaud by Julie Verleye for the Opération Thalie Envolée. The Hohenzollern Castle under a rainbow. The castle is about 50 km south of Stuttgart, Germany. It is the ancestral seat of the Hohenzollern family, which emerged in the Middle Ages and eventually became German Emperors. English : The Hohenzollern Castle under a rainbow. The castle is about 50 km south of Stuttgart, Germany. It is the ancestral seat of the Hohenzollern family, which emerged in the Middle Ages and eventually became German Emperors. English : Mickey is a 1918 silent comedy-drama film starring Mabel Normand, directed by F. Richard Jones and James Young, and written by J.G. Hawks. The Rouen Cathedral as seen from the Gros Horloge tower. The church was the tallest building in the world from 1876-1880 with a height of 151m. 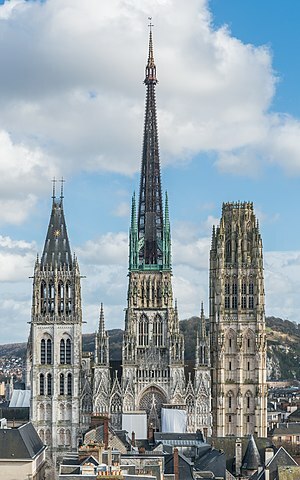 English : The Rouen Cathedral as seen from the Gros Horloge tower. The church was the tallest building in the world from 1876-1880 with a height of 151m. English : Molobratia teutonus is an European member of the robber flies. Mirrors Gallery, a section graved in the rock of the roman aqueduct near Albarracín, Teruel, Aragón, Spain. English : Mirrors Gallery, a section graved in the rock of the roman aqueduct near Albarracín, Teruel, Aragón, Spain. English : Botanical Garden of Curitiba during the build-up to the 2014 FIFA World Cup. “The Strip” (part of the Las Vegas Boulevard) in Las Vegas (Nevada, USA). English : “The Strip” (part of the Las Vegas Boulevard) in Las Vegas (Nevada, USA). English : Local artisan cutting and filing animal horn to make combs in Alappuzha, Kerala, India. English : Hellamaa bay in Hiiumaa. English : Prelude to Act 1 for Carmen by Georges Bizet. Sunrise landscape in Huitzila, Hidalgo, Mexico. English : Sunrise landscape in Huitzila, Hidalgo, Mexico. English : A European honey buzzard (Pernis apivorus) loots a wasps' nest. Scene in Długa Street with the Main Town Hall in the background, Gdansk, Poland. English : Scene in Długa Street with the Main Town Hall in the background, Gdansk, Poland. English : Tess of the Storm Country is a 1914 drama, based on the novel of the same name by Grace Miller White. Ko Tapu is a 20 m tall islet in front of the Khao Phing Kan islands, in the Phang Nga Bay, in Thailand. The island belongs to the Ao Phang Nga National Park and since 1974 is also known as James Bond Island, because the James Bond movie The Man with the Golden Gun was filmed there. English : Ko Tapu is a 20 m tall islet in front of the Khao Phing Kan islands, in the Phang Nga Bay, in Thailand. The island belongs to the Ao Phang Nga National Park and since 1974 is also known as James Bond Island, because the James Bond movie The Man with the Golden Gun was filmed there. Golden Barrel Cactus (Echinocactus grusonii), Munich Botanical Garden, Germany. English : Golden Barrel Cactus (Echinocactus grusonii), Munich Botanical Garden, Germany. The St Michael Church of Engolasters, located in Engolasters, Andorra, is a Romanesque church from end of 11th or beginning of the 12th century. The church, one of the most popular in Andorra, is part of its Cultural Heritage and is characterized by a disproportionally high bell tower. English : The St Michael Church of Engolasters, located in Engolasters, Andorra, is a Romanesque church from end of 11th or beginning of the 12th century. The church, one of the most popular in Andorra, is part of its Cultural Heritage and is characterized by a disproportionally high bell tower. English : Audio recording of Spleen - J'ai plus de souvenirs que si j'avais mille ans by Charles Baudelaire by Antoine Giet for the Opération Thalie Envolée.